Today is the first day that we have had a small taste of spring and it has inspired me to show more colorful and happy designs. I made a flower garden gift bag that can also be used as an Easter basket bag. I love making my own gift bags because they are very easy to create, less expensive than a purchased bag and they can be made in advance. 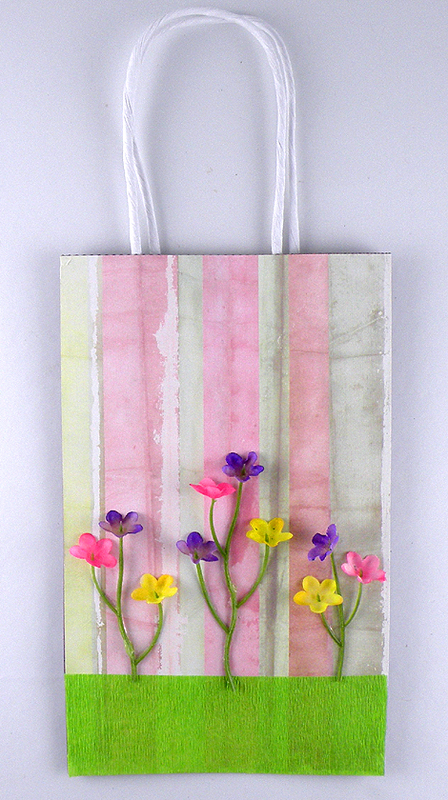 I used crepe paper to make the grass and fabric flowers to transform a plain gift bag into a beautiful flowering garden. Cut a piece of scrapbooking paper the length and width of the front of the gift bag. Attach to the front of the gift bag with a glue stick. Cut three pieces of crepe paper the width of the gift bag. Place the pieces together and fold them in half. Cut V shapes on the long edge to create grass. It will look more like grass if they are not all the same size. 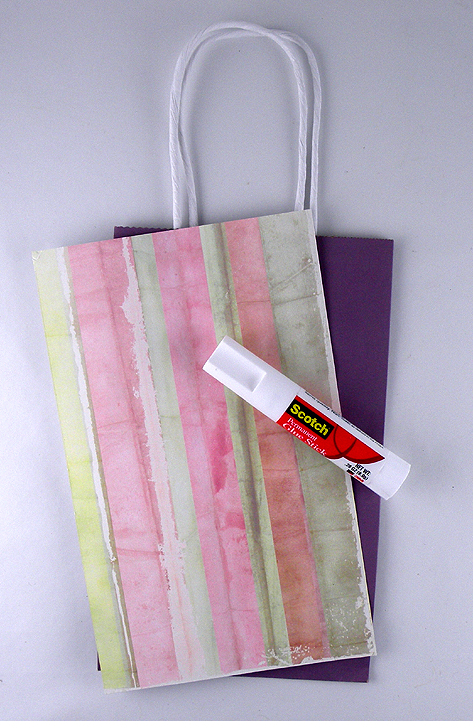 Attach a strip of crepe paper at the bottom edge of the bag with craft glue. Glue three flower stems just above the crepe paper. Cut two 6 inch pieces of ribbon and create two ribbon loops with craft glue. 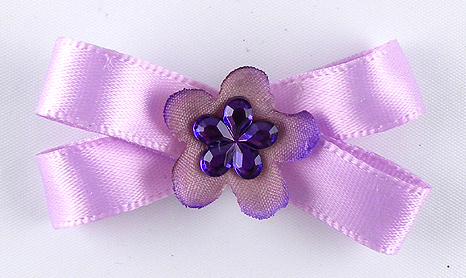 Glue the centers together to create a bow and attach the flower rhinestone. 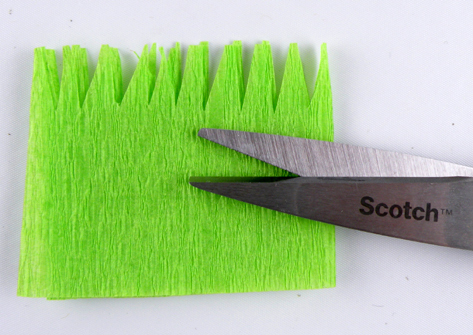 Unfold and separate the grass crepe paper and glue each piece to the bottom front of the bag. Leave ½ inch between each layer and fluff the blades of grass to give it a 3D effect. Attach a ribbon strip and the bow to the bottom of the gift bag with craft glue. Attach the strips of ribbon and flowers to the top part of the gift bag and fill with green tissue to finish. This will definitely bring a smile to someone’s face even before they see the gift inside. 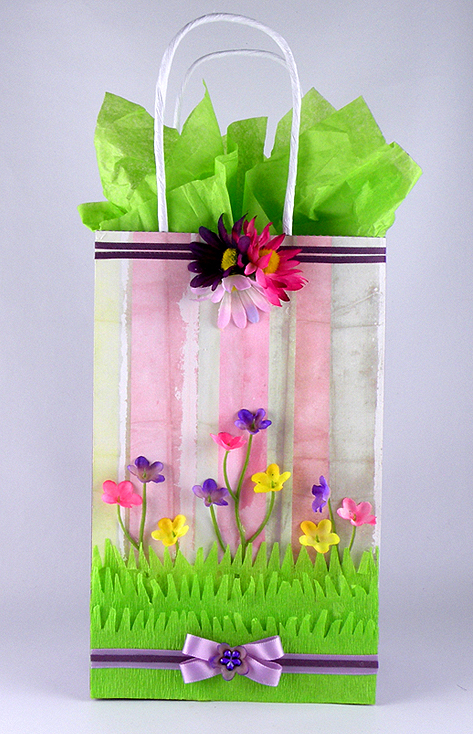 This entry was posted in Crafts, Everything, Gift Wrapping and tagged crepe paper grass, Easter gift bag, Flower garden, flower gift bag, Gina Tepper, hand-made gift bag, spring flowers, spring gift bag. Bookmark the permalink.